Gandhi said the Nyay scheme will give money to 20 per cent poorest families in India and also remonetise the economy damaged by demonetisation. In an exclusive interview to PTI ahead of the 17th general election beginning April 11, Gandhi said the ‘Nyay’ scheme has the twin objectives of giving money to the 20 per cent poorest families in India and remonetising the economy “damaged” by demonetisation. “What the PM has done over the past five years is to remove all money from the economy with failed policies like demonetisation and a poorly executed Gabbar Singh Tax (GST). Informal sectors have been badly hit. “The aim of the ‘Nyay’ scheme is two-fold. First is to guarantee a minimum income to the bottom 20 per cent families. The second is to remonetise the economy that has been demonetised by Modiji,” Gandhi said. The Congress chief said there is a reason why the party christened the scheme ‘Nyay’, which translates to justice in Hindi. “There is another aspect to calling the scheme ‘Nyay’. Why have we chosen to call this scheme ‘Justice’? Because over the last five years, Mr Narendra Modi has simply snatched from poor and given nothing back. “He has taken away from the farmers, he has snatched from the small and medium businesses, he’s taken away from the unemployed youth, he has extinguished the savings of mothers and sisters of this country. We want to return to India’s deprived sections what Modiji has snatched from them,” Gandhi said. Terming ‘Nyay’ (Nyuntam Aay Yojana) a “game changer” and a “final assault” on poverty, Gandhi said the scheme is “fiscally perfectly doable and will not be implemented “rashly like demonetization and GST of the BJP”. To a question on the scheme being prima facie populist, Gandhi said “it is not a populist measure as projected by some critics”. “If giving out Rs 3.5 lakh crore to 15 people by Narendra Modi is not considered populist, why should this be as it is aimed at benefitting the poor,” he said. “Is it only the crony capitalist friends of Mr Modi who are to benefit from government schemes? I’m only asking for fairness, for justice, or ‘nyay’ for India’s poor. There’s nothing populist about that,” he countered. 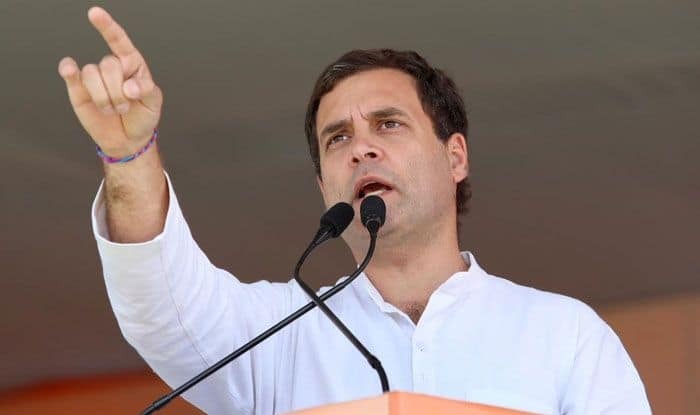 The Congress president did not give a time line on when the party planned to make India poverty free and said ‘Nyay’ will first be tested through a pilot to “smoothen out any flaws”. “We’re not going to do it the way GST was done. We are first going to run a short pilot project to smoothen out any flaws in the implementation process and then roll it out nationwide. We’re also going to set down a robust way of identifying the beneficiaries so that no deserving family is left out,” he said. “This is for the experts to decide. In the 10 years of the Congress-UPA government, we took 14 crore people out of poverty net. Our goal now is to finish the job,” he said. Gandhi added that 20 per cent to 22 per cent families are living in poverty even today. Many of them have been pushed into this cycle by the prime minister’s demonetisation scheme and ‘Gabbar Singh Tax’ (GST), he noted. “Our goal is to completely eliminate poverty from India,” he said, describing ‘Nyay’ as the final assault on poverty.